Welcome to May! If you plan on enjoying those May flowers brought by April showers, I suggest you take your food outdoors. How about a picnic? This Pesto Bacon Chicken Salad is a dish that is great for picnicking. Pack a container of the salad in your cooler. Add a container of sliced tomatoes and a small bag of fresh basil leaves. 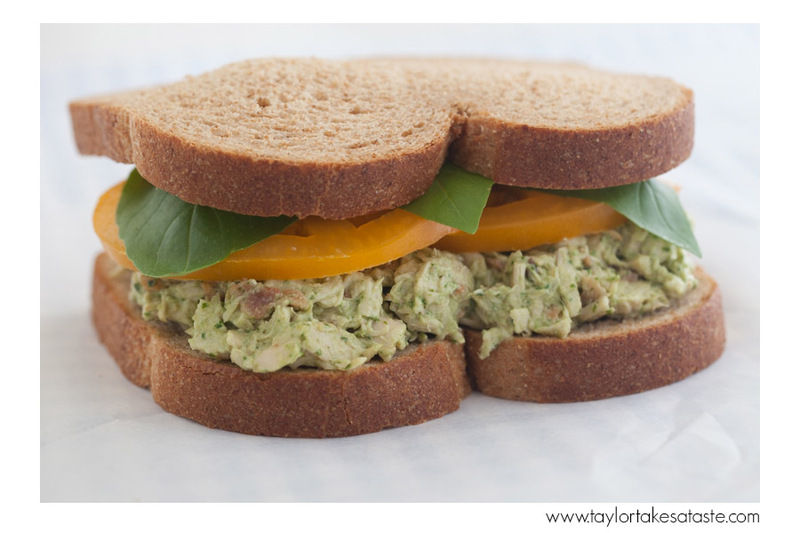 All you have to do is bring a loaf of bread and you have the ingredients for a delicious and filling Pesto Bacon Chicken Salad Sandwich. If you are more interested in a snack size portion at your picnic, bring a sleeve of your favorite cracker to accompany your container of chicken salad. Once at your destination, you can spread the beautiful pale green salad onto your cracker. If crackers are too much, there is nothing wrong with just grabbing a spoon and eating the salad straight from the bowl. Regardless of how you accompany it, this Pesto Bacon Chicken Salad makes a perfect spring meal! 1. In a large bowl add the chicken, bacon, mayonnaise, pesto, peppers and onions. Stir well to blend. 2. Add the lemon juice, lemon zest, Tabasco, salt and pepper. Stir well to blend. Cover the chicken salad with plastic wrap and chill for at least 30 minutes to allow the flavors to blend. Serve over lettuce or as a sandwich. Hi – I wanted to try this recipe out this week – looks great. Did you mean to link to the pesto recipe? I tried searching but the link seems to be not working.